INCREDIBLE DIRECT TRANSFER OF THE 1830 FIRST EDITION OF THE BOOK OF MORMON. 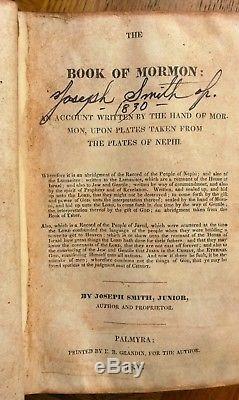 An Account Written by the Hand of Mormon, Upon Plates Taken from the Plates of Nephi. By Joseph Smith, Junior, Author and Proprietor. Palmyra [NY]: Printed by E.
Grandin, for the Author, 1830. OWNING THIS BEAUTIFUL, LEATHER BOUND, NUMBERED, DIRECT TRANSFER OF THE FIRST EDITION OF THE BOOK OF MORMON IS CERTAINLY AN EXCITING OPPORTUNITY FOR US ALL. THE VOLUME IS HAND BOUND AND CRAFTED WITH A HEAVY, STURDY LEATHER BINDING, AGED IN APPEARANCE TO MIMIC ITS ORIGINAL COUNTERPART AND RECREATING EVERY SINGLE WORD ORIGINALLY TRANSCRIBED BY THE PROPHET JOSEPH SMITH. EACH BOOK HAS BEEN HANDCRAFTED AND AGED 175 YEARS TO SIMULATE THE ORIGINAL 1830 BOOKS. EVERY BOOK IS DONE PERSONALLY BY BOOK BINDER STEVE BLAKE WHO, AFTER HAVING A FIRST EDITION IN HIS FAMILY FOR MANY YEARS, DECIDED TO RECREATE HIS FAMILY'S BOOK SO EVERYONE COULD HAVE THE OPPORTUNITY TO OWN THEIR OWN. EACH BOOK IS NUMBERED AND SIGNED. 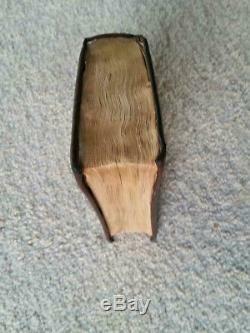 DUE TO IT BEING HANDCRAFTED, NO TWO BOOKS AGING WILL LOOK EXACTLY ALIKE. WHAT AN EXCITING OPPORTUNITY TO BE ABLE TO OWN THIS ONE-OF-A-KIND PIECE OF AMERICAN HISTORY AND ARGUABLY ONE OF THE MOST INFLUENTIAL SPIRITUAL WORKS OF OUR TIME. JUST HOLDING THIS VOLUME IN YOUR HANDS IS AN EXCITING EXPERIENCE. THE QUALITY IS OUTSTANDING AND WILL LAST ANOTHER 177 YEARS. Joseph Smith kept the original manuscript himself and eventually deposited it in the cornerstone of the Nauvoo House when it was being built. When the Nauvoo house was torn down in the early 1900's, the original manuscript was discovered. It had been water-damaged over the years in storage. The good sheets were divided between those present. All of these pages found their way into private libraries and are not on display to the general public. The largest portions are in the LDS Church Library and the Wilford C. Occasionally, a very few photocopies of individual pages have appeared in official LDS Church publications over the years. History of the Book of Mormon Printing's. The first edition of the Book of Mormon came out in March of 1830. 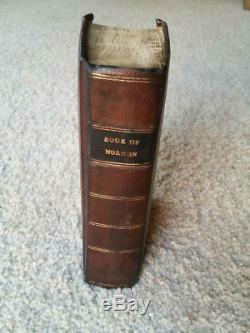 The 1840 and 1842 Nauvoo editions were the last two editions printed in Joseph Smith's lifetime. In 1869, Brigham Young had the 1842 edition reprinted in his newly invented phonetic alphabet. Apostle Orson Pratt was in charge of the 1879 revision, which was the first version with verses and footnotes. Apostle James Talmage was in charge of the 1920 revision, which put the text into two columns and changed the footnotes. McConkie was a key influence in the 1981 revision with new footnotes, cross references and a revised Topical Guide. As these editions were printed in following years, the printing dates were updated without changing the text. Thus, the text of all Books of Mormon dated from 1921 to 1980 is the same as 1920. In summary, there are seven regular English versions of the Book of Mormon officially printed by the authority of the LDS Church in America (1830, 1837, 1840, 1842, 1879, 1920, and 1981). Of these seven different versions, the 1837 Kirtland Edition is the most rare. There are multiple reasons for this, and one is that very few were printed. Another is that time has taken its toll with the old leather and paper to the point that many of these have deteriorated into nonexistence. A third reason is that this edition contained the largest portion of the major changes that are still printed in today's modern edition. Please take the opportunity to view some of my other auctions as many of the titles I stock are out-of-print and no longer available at most book stores. There's been some confusion regarding these volumes, which I regret and will attempt to correct. If you will read the description, it clearly states that the book is recreated from an original copy owned by the publisher. It is a direct print from an original copy of the book. Each of the volumes is individually hand crafted by one of the most gifted, dedicated and truly inspired artists in this discipline. Some of the work might take a bit longer to create and the materials, sources are harder to collect. In any event; we promise the prices asked are not intended to be egregious. One situation that should be mentioned is that the LDS Church has requested the insertion of a discreet marker, within each produced work, to help prevent the re-sale of these volumes as authentic, original, period pieces. The origin of the book, as it is a direct copy from the printers own family owned volume, and the fact that it is entirely handcrafted by the printer himself, puts this work in the same category as a print done from an original by, as an example, Norman Rockwell (the first artist who comes to mind). It is a limited edition replica print that is unique and actually quite rare. The item "LDS THE BOOK OF MORMON 1830 LEATHER BOUND FIRST EDITION SIGNED JOSEPH SMITH" is in sale since Saturday, April 28, 2018. This item is in the category "Books\Antiquarian & Collectible". The seller is "lauriroo_2" and is located in St. This item can be shipped to United States, all countries in Europe.